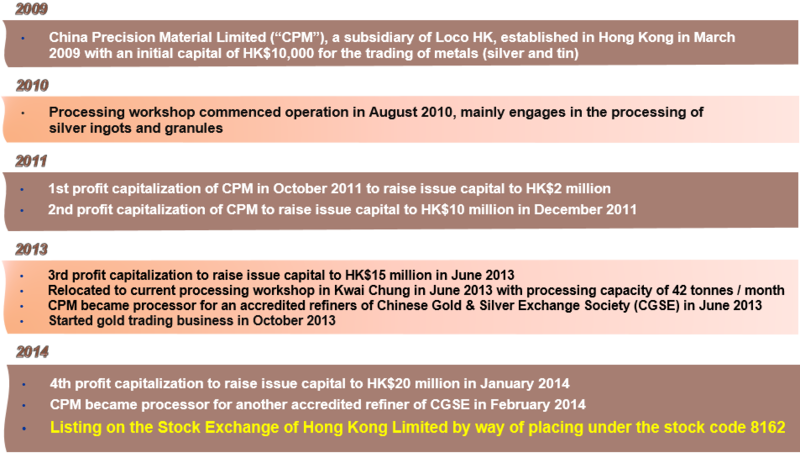 Loco Hong Kong Holdings Limited (the “Loco HK”) (together with its subsidiaries, the "Group"), a fully integrated metals trader and processor based in Hong Kong, announced the details of its proposed listing on the Growth Enterprise Market (“GEM”) of The Stock Exchange of Hong Kong Limited by way of placing on 29 July 2014. Dealings in the Company’s shares have commenced on GEM on 5 August 2014 (Tuesday) under the stock code 8162. Having the silver business commenced in 2009, Loco HK. through its operating subsidiary, China Precision Material Limited, is principally engaged in the trading of metals, including silver, gold and tin, and the processing of silver products in Hong Kong. It is one of the few reputable metal traders in Hong Kong which has its own fully integrated processing facilities and is capable of providing a diversed range of silver products to international customers. The Group has a diversified customer base, consisting of licensed banks and metal traders in Hong Kong, Singapore, Japan, Taiwan, Australia, the United Kingdom and Dubai. It has been a preferred silver supplier largely due to its ability to process silver products into customised forms. Stability of product quality, timely delivery of products at competitive prices, as well as sustainable and adequate supply of metals have also earned deep trust in Loco HK from customers worldwide. Mr. Wang Wendong, was appointed as executive Director and Deputy Chairman with effect from 11 May 2018. Mr. Wang has more than 25 years of extensive experience in real economy investment. Since the 1990s, Mr. Wang has served as a group vice president in an international group of companies. Such group has significant footprint in the People’s Republic of China and Hong Kong including international trade, farming, education, culture industry, real estate and consumer goods. Mr. Zhu Hongguang was appointed as a Director on 24 August 2016. He is also the Chairman of the Board and an executive Director. Mr. Zhu has over ten years’ experience in operations and management in the segment of real economy investment. Mr. Zhu established Sichuan Wenjie Materials Co., Ltd. and Chengdu Yuantai Industrial Investment Co., Ltd. in 1995 and 2000 respectively. He served as the director of Chengdu College of Arts and Sciences in 2003. Mr. Zhu also established Chengdu Zhongxing Water-supply Company Limited and has been its chairman since 2004. Then Mr. Zhu diversified his working experience into mix financial sector. Mr. Zhu established Chengdu Lingduoji Investment Co., Ltd. and Chengdu Weide Equity Investment Fund Management Co., Ltd. in 2013 and also has been the general manager of such companies since then. He obtained a degree of Master of Science in Management with Operations from University of Bath in 2007. Mr. Felipe Tan was appointed as a Director on 14 February 2014. He has served as a director of China Precision Material Limited and CPM Silver Limited, wholly-owned subsidiaries of the Company since March 2009 and May 2009 respectively. He is responsible for the overall corporate strategies, management, planning business development and hedging activities of the Group. Mr. Tan has over 30 years of experience in metal trading and monitoring hedging activities, including more than 13 years of management experience in the mining industry in the PRC. Currently, he is the chairman of the board, president and chief executive officer of GobiMin Inc. (“GobiMin”) (Symbol: GMN), a company engaged in the exploration and exploitation of mineral resources in Xinjiang, the PRC and shares of which have been listed on the TSX Venture Exchange since 1 October 2005. GobiMin is a major shareholder of the Company and holds the shares in the Company through its subsidiaries. Mr. Tan has also been an executive director of Timeless Software Limited (“Timeless”) (stock code: 8028) since 30 September 2012, and has been appointed as the chairman of the board of directors of Timeless since 29 July 2016. Timeless is principally engaged in the computer hardware and software and mining business, the shares of which are listed on GEM. In addition, Mr. Tan is a director of Jiangmen Proudly Water-soluble Plastic Co., Ltd. (NEEQ: 833367), the shares of which are traded on the National Equities Exchange and Quotations in the PRC since 10 September 2015. Ms. Wu Liyan was appointed as an independent non-executive Director on 29 September 2018. Ms. Wu is currently the marketing director of Pacific International Securities Limited. Ms. Wu received a bachelor’s degree in science from University of Minnesota and a master’s degree in science from New York University. Ms. Wu has more than 9 years of marketing and business development experiences in renowned investment management companies. Mr. Zhou Tianshu was appointed as an independent non-executive Director on 29 September 2018. Mr. Zhou is currently the executive CEO of Skyho Aviation Technology Co., Ltd.. Mr. Zhou received a bachelor's degree in engineering from Civil Aviation University of China and a master’s degree in law from Wuhan University. Mr. Zhou has over 20 years of experience in enterprise planning, business investment and risk control. Mr. Zhou has worked in a major state-owned aviation enterprise in the People’s Republic of China for over 17 years, mainly in enterprise planning and management positions. Mr. Zhou also held management positions in China Aircraft Leasing Group Holdings Limited, a company listed on the Main Board of the Stock Exchange (Stock Code: 1848) and its subsidiary, Aircraft Recycling International Limited. Ms. Dai Meihong was appointed as an independent non-executive Director on 25 April 2017. Ms. Dai graduated from Shanghai University of Finance and Economics with a bachelor degree in economics majoring in accounting in 1993. Ms. Dai continued her education at The University of Texas at Arlington, which Ms. Dai obtained her master degree of business administration in 2009. Ms. Dai is certified public accountant of The Chinese Institute of Certified Public Accountants, chartered management accountant and chartered global management accountant of Chartered Institute of Management Accountants. Ms. Dai has wide range of experience in multinational companies, including finance, accounting, budgeting, business operation, internal control, ERP system management, legal and compliance. Ms. Dai is currently a partner of Shanghai Youyi Information Technology Company Limited. Ms. Dai served as chief executive officer of Shanghai Bracco Sine Pharmaceutical Corp., Ltd., financial controller of Shanghai (Singer) Sewing Machine Company Limited and senior internal auditor of internal audit of China region of Sinar Mas Group. Ms. Tsang Wai Chun Marianna was appointed as an independent non-executive Director on 22 July 2014. Ms. Tsang is the Managing Director of TWC Management Limited. She is a member of the Institute of Chartered Secretaries and Administrators, the Hong Kong Institute of Company Secretaries, the Taxation Institute of Hong Kong, the Chartered Institute of Personnel and Development, the Society of Registered Financial Planners, the Chartered Institute of Arbitrators, the Institute of Financial Accountants and Institute of Public Accountants in Australia. Ms. Tsang has over 30 years of company secretarial, corporate affairs, and related legal working experience in major commercial corporations and in professional firms. She has a postgraduate certificate in Professional Accounting in November 2002. Ms. Tsang has served as an independent non-executive director of Timeless since 16 October 2003. Copyright © 2019 Loco Hong Kong Holdings Limited. All Rights Reserved.